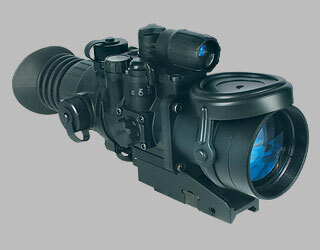 Phantom 3x50 Night Vision Riflescope 2nd Gen. II Tube takes into account all the requirements for modern night hunting. Utilising a military-style design and offering maximum functionality, the Phantom is an obvious choice for anyone who demands the highest quality and impeccable reliability. It is fully weatherproofed, thanks to a nitrogen filled optical channel and waterproofing to IPX6, and can be used anywhere. Arctic ice fields or desert sands, humid tropical forests or harsh Siberian taiga – the Phantom is ready to do its job regardless of weather conditions. The body of the Phantom is made of highly durable glass-filled plastic. The bodyshell design and high grade intensifier tubes ensure shockproofing to heavy calibres, including 9.3x62, 9.3x74 and 375H&H. The Gen 2+ tube has Automatic Brightness Control (ABC) and, coupled with the high quality, wide-aperture lens, provides a sharp and clear picture. The high light gain, combined with the built-in IR - Illuminator, allows hunting even in situations of critically low night illumination (down to 10-4 lx – overcast starlight). The fast start-up function (the sight is “On” only while pressing a button) is very useful for making quick assessments. The problem of choosing a reticle has also been solved effectively. With the Phantom, you can choose the most suitable reticle configuration and change it by simply pressing a button (the Phantom with the Mil-Dot reticle is also available). The voltage stabilization system eliminates reticle shift even with an almost discharged battery. All main controls are on top of the body simplifying accessibility. ** - Max. detection range of an object measuring 1.7x0.5 m in natural night conditions (0.05 lux, quarter moon).